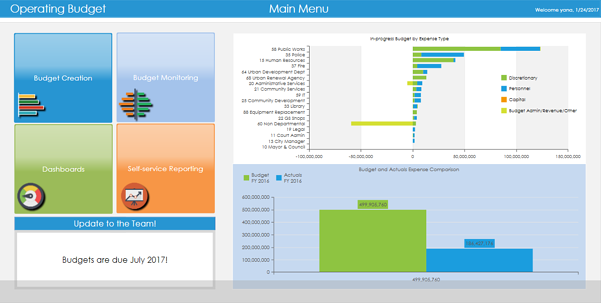 Our Operating Budget software solution for public sector organizations includes a rich set of features and functionality to implement a powerful and user friendly system that can accommodate customers’ unique requirements and needs. The solution automates the creation of the base budget as well as any supplemental requests or service level changes. It is capable of housing multiple parallel organizational hierarchies and roll-up levels (performance-oriented, organizational, departmental, CAFR and others). Our solution offers key benefits to every member of your organization, from analysts to decision makers and external stakeholders. The solution allows your team members to connect budget decisions to strategic outcomes, improving efficiency, visibility and auditability, and ultimately, fostering collaboration.